The VRJ6-6 vent valve is unique in the motorsports world. 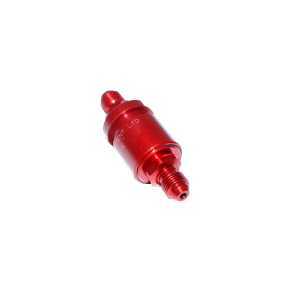 This valve combines the features of a standard rollover vent valve (allows the fuel tank to breathe) with the added features of a discriminator valve (discriminates between fuel and water) which prevents fuel from "burping" out of the vent line. Lastly, the valve has a 200 millibar pressure by-pass feature that prevents pressure from building up in the tank. The valve is approved for use by the FIA. The valve features -6 AN fittings on either end for ease of installation. Click on the spec sheet for a complete description of the valve and dimensions of the valve body. The VRJ6-6 vent valve is unique in the motorsports world. This valve combines the features of a standard rollover vent valve (allows the fuel tank to breathe) with the added features of a discriminator valve (discriminates between fuel and water) which prevents fuel from "burping" out of the vent line. Lastly, the valve has a 200 millibar pressure by-pass feature that prevents pressure from building up in the tank. The valve is approved for use by the FIA. The valve features -6 AN fittings on either end for ease of installation. 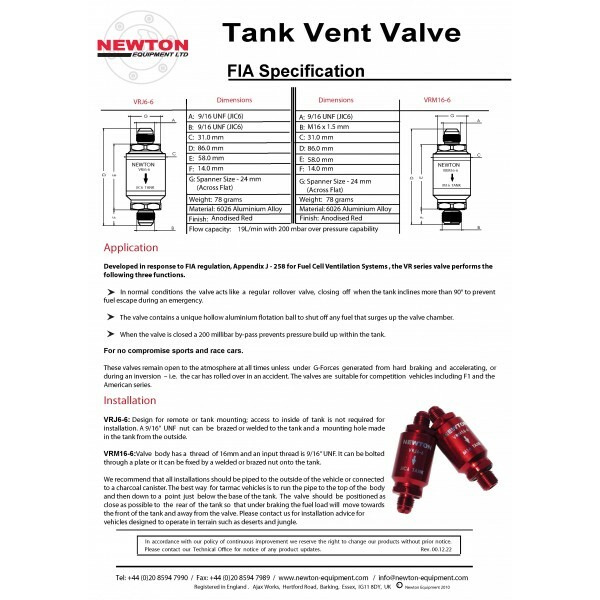 Click on the spec sheet for a complete description of the valve and dimensions of the valve body.